Build & program robots with this compete robotics engineering system! Learn how the sensors can be used to control the robots! Build and program robots with this compete robotics engineering system. Using sensors, motors, a core controller, and hundreds of snap-together building pieces, you can follow the instructions to assemble 10 different robots. The versatile parts also allow you to make robots according to your own designs. 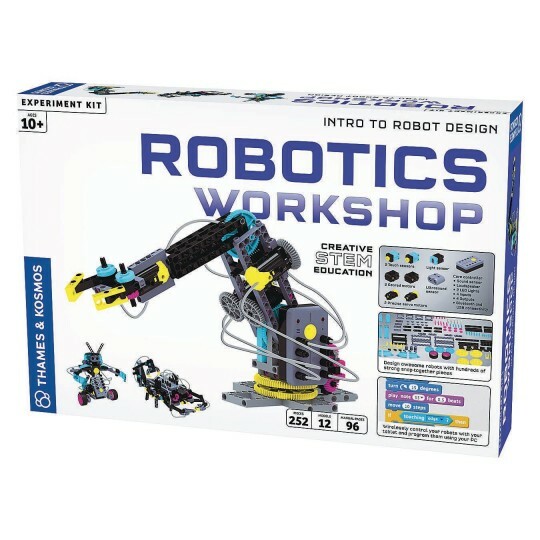 This fun robotics curriculum starts out with instructions for building simple robots, teaching you how the sensors can be used to control the robots. Build an ultrasound robot that can avoid obstacles, a line tracker robot, a touch sensor robot, and a doodling robot. Move on to more complex robots that have multiple functions, such as a ball-manipulating robot, a crawling robot, and a grabbing robot. Finally build some functional, helpful robotics including an automated door-opening robot and a protected robotic safe to store your valuables. After you have mastered all of the robotic models in the instructions, you will have the tools and knowledge you need to go on and build and program your own amazing robotic creations. The robots can be controlled directly in real-time and programmed to perform series of commands using an easy-to-use, free downloadable app on tablets and smartphones. The app wirelessly connects to the core controller using a Bluetooth low energy connection. You can create more complex programs using the open source visual block programming editor Google Blockly on a PC with a USB connection to the core controller. The app requires a tablet or smartphone running iOS or Android®. A 64-page, full-color manual features step-by-step illustrated building instructions and instructions for how to program and operate the models. Robotic Components: Ultrasound Sensor Your robot’s eyes! The ultrasonic sensor helps your robots gauge distances and determine where objects are. Using the core controller, the ultrasonic sensor is able to detect an object and measure its proximity.